West Georgia Technical College Dental Hygiene students were able to put their education to work cleaning children’s teeth at an event with TeamSmile and the Atlanta Falcons last month at Mercedes-Benz Stadium. 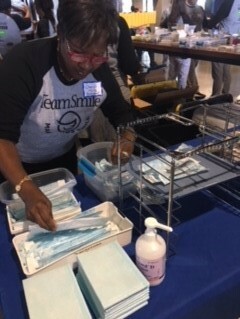 West Georgia Technical College Dental Hygiene Department Director Cheryl Mills helps organize supplies at an event with TeamSmile and the Atlanta Falcons last month. TeamSmile is an advocacy group that partners oral health professionals with professional athletic organizations to provide dental care to underserved children in the community. In 2017, TeamSmile provided $45,599 worth of free dental care, preventative care and health education for children in the Atlanta area. WGTC Dental Hygiene student Michelle Good said she thinks the program will continue to grow. Dental Hygiene Program Director Cheryl Mills said the event was very successful and a very valuable opportunity for the students who participated. “Participation in an event such as this offers the students an opportunity to experience their future. There is no better teacher than hands-on experience,” Mills said. For more information about the Dental Hygiene program at West Georgia Tech, visit westgatech.edu/dental-hygiene.